Knowledge of statistics is essential in modern biology and medicine. Biologists and health professionals learn statistics best with real and interesting examples. 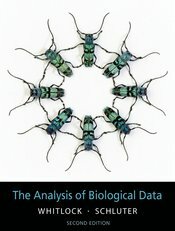 The Analysis of Biological Data, Second Edition, by Whitlock and Schluter, teaches modern methods of statistics through the use of fascinating biological and medical cases. Readers consistently praise its clear and engaging writing and practical perspective. The second edition features over 200 new examples and problems. These include new calculation practice problems, which guide the student step by step through the methods, and a greater number of the examples and topics come from medical and human health research. Every chapter has been carefully edited for even greater clarity and ease of use. All the data sets, R scripts for all worked examples in the book, as well as many other teaching resources, are available to qualified instructors (see below). The Analysis of Biological Data is the most widely adopted introductory biological statistics textbook. It is now used at well over 200 schools and on every continent.